TODAY’S GAME: The Generals open a 4-game series in 3 days tonight against the Huntsville Stars at Pringles Park. Jackson leads the SL North standings by 1 1/2 games over Chattanooga. Huntsville is the only team in the league with a winning record against the Generals (8-7). GENERALS RECAP: The Generals won their 3rd straight 9-2 over Tennessee on Tuesday night, winning the series over Smokies, taking 3 of 4. Jackson has now won 5 consecutive series. In his first game since returning from the DL, 3B Francisco Martinez (3×4, 2 R, HR, 2 RBI) led the team with 3 hits, including hitting a 2-run home run in the 3rd inning. 2B Stefen Romero (2×5, R, 2B, RBI), LF Joe Dunigan (2×5, R, HR, 3 RBI) and 1B Rich Poythress (2×3, RBI, BB) each recorded 2 of the Generals 13 hits. Dunigan hit his league-leading 19th home run of the season with a 2-out 2-run home run in the 5th inning. Poythress recorded 2 hits and extended his team-high hitting streak to 13 games. Starter Brandon Maurer (6.0,5,2,2,3,7) recorded his 7th win of the season, allowing 2 run on 5 hits in 6.0 innings. Relievers Jonathan Arias (1.0,0,0,0,1,2) and Jose Jimenez (2.0,1,0,0,1,2) combined to strike out 4 recordin the final 9 outs of the game to secure the win. SCORING SPREE: Over the course of the last 6 games, the Generals are 5-1 and have scored 47 runs with 69 hits and 7 home runs. During the past 2 games, Jackson has scored 19 runs. In 15 games in July, Jackson has scored 87 runs with 42 doubles, 7 triples and belted 14 homers. DUNIGAN ON A TEAR: 2-time SL Hitter of the Week Joe Dunigan (pictured right, Michelle Gachet) has recorded 16 RBI during his last 10 starts, batting .308 (12×39) with 8 runs scored, 4 doubles, 1 triple, 5 home runs and 16 RBI. During this stretch he leads the Southern League in RBI. He currently leads the leage with 19 home runs. FEELS GOOD AT THE TOP: The Generals 58 wins are the most in the Southern League. Jackson ranks 1st in pitching, with a 3.15 ERA and T-1st in team batting average at .263. The Generals lead the league in total bases, slugging percentage and home runs with 75. WHO’S HOT? : INF Rich Poythress extended his hitting streak to a Generals season-high 13 games, batting .444 (20×45) with 7 runs scored, 4 doubles and 5 RBI. -> OF Chih-Hsien Chiang is batting .378 (14×37) with 6 runs scored, 4 doubles, 2 home runs and 3 RBI during his current 8-game hit streak. VIVA LA ROMERO: INF Stefen Romero has hit safely 18 of 21 games with 12 multi-hit games with Jackson since his promotion, batting .378 (31×82) with 16 runs scored, 9 doubles, 2 triple, 4 home runs and 27 RBI. 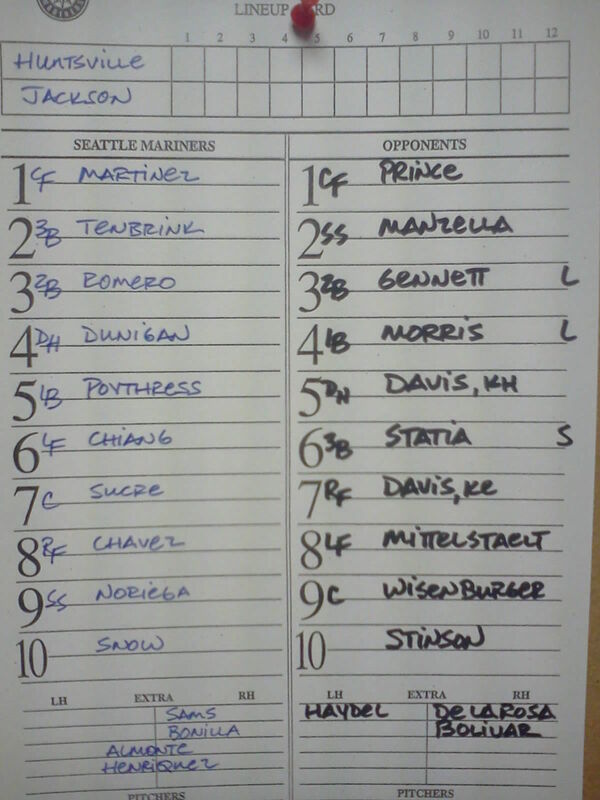 MARATHON IN TACOMA LAST NIGHT: Former General Scott Savastano hit a walk-off solo home run with 1 out in the bottom of the 18th inning to end Tacoma’s longest game of the season with a 2-1 win over Sacramento. 1B/P Savastano (1.0,0,0,0,0,0 – 1×2, R, HR, BB) was also named the game’s winning pitcher after retiring all 3 batters he faced in the top of the inning. The 18-inning affair was the most played by the Rainiers since the club powered through 18 frames at Iowa on August 1, 1999. TODAY’S GAME: The Generals look to win their 3rd straight game and 5th straight series tonight in game 4 of the series at Smokies Park, with first pitch at 6:15 CT. Jackson leads the SL North standings by 1 1/2 games over Chattanooga and 3 1/2 games over the Smokies. 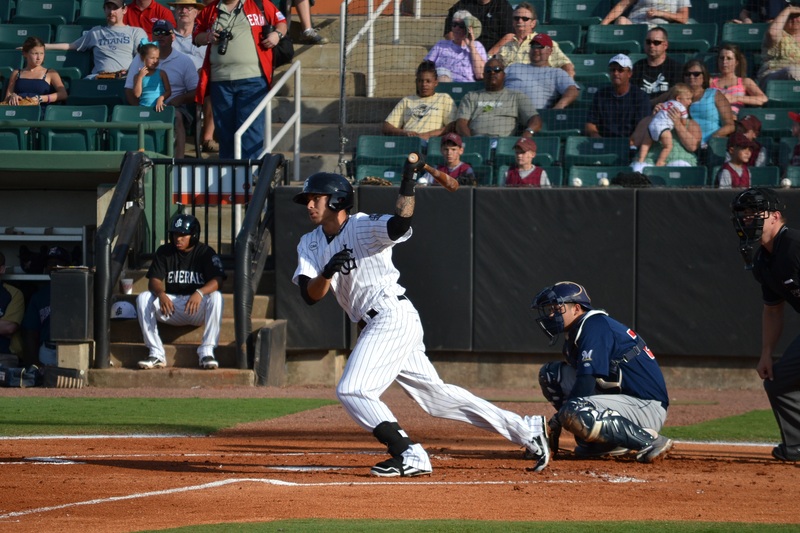 GENERALS RECAP: The Generals had to work extremely hard Monday to get to 20-games above .500 for the first time. 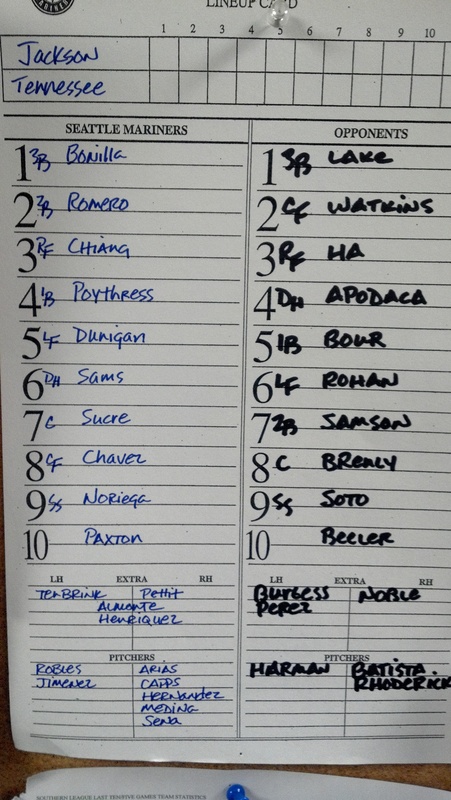 Jackson won their 2nd straight, 10-8 over the Smokies, in a game that lasted 4 hours and 10 minutes. The teams combined for 28 hits and 10 pitchers used in the game. It was the longest 9-inning in the SL this season. Jackson jumped out to a 6-0 lead and led 8-2, but Tennessee came back to tie the game at 8-8 in the 6th. The Generals responded in the 7th. Leury Bonilla opened the inning with a single and was sacrificed to second by Gabriel Noriega. Denny Almonte singled to center scoring Bonilla and Jackson led 9-8. Stefen Romero brought in Almonte with a sacrifice fly later in the inning to make the score 10-8. Starter Anthony Fernandez failed to get his 5th straight win, getting a no decision. Fernandez allowed 4 runs on 9 hits in just 4.0 innings of work. Yoervis Medina (3-4) earned the win pitching 2.0 pressure packed innings in the 6th and 7th. Medina struck out 4 and allowed just 2 hits. Jandy Sena pitched a scoreless 8th and Carter Capps saved his 17th game of the year with a scoreless 9th. Rich Poythress (pictured below, Adam Brimer) was 2-for-4, extending his hitting streak to a Generals season-best 12 games. 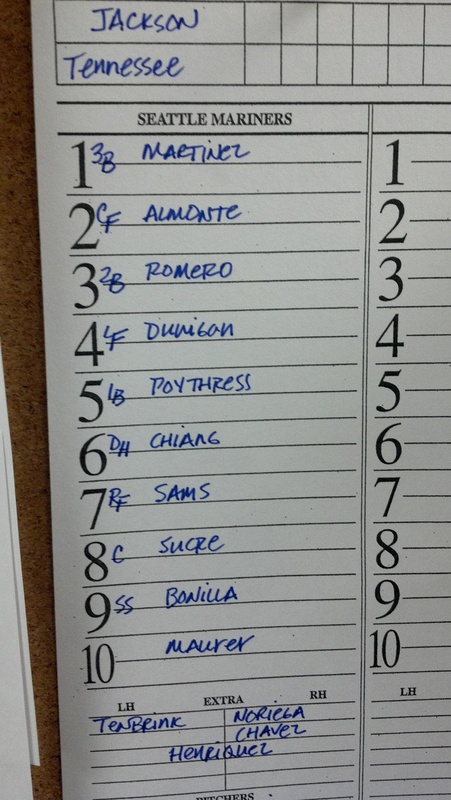 Denny Almonte, Stefen Romero, Chih-Hsien Chiang and Bonilla collected two hits each for the Generals. Romero, Dunigan and Noriega collected two RBI’s apiece. SCORING SPREE: Over the course of the last 5 games, the Generals are 4-1 and have scored 38 runs, batting .318 with 56 hits and 5 home runs. In 14 games in July, Jackson has scored 78 runs with 40 doubles, 7 triples and belted 12 homers. 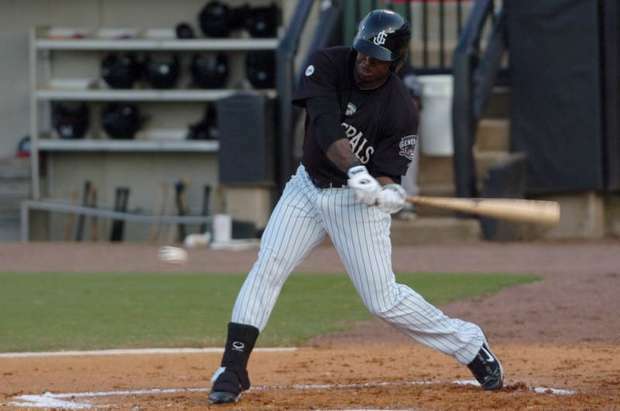 DUNIGAN NAMED SL HITTER OF THE WEEK: Monday, the Southern League announced that Generals OF/DH Joe Dunigan is the SL Hitter of the Week for the second time. He batted .357/.412/1.071 in 4 games last week going 5-for-14, 2 doubles, 1 triple, 2 home runs, 5 RBI, 4 runs, and 1 stolen base during the past week. In total this season Joe is batting .273 with 18 home runs (T-1st SL) and 50 RBI. Dunigan ranks 2nd in the league in slugging percentage (.543), 4th in total bases (157) and 4th in extra-base hits (39). He recorded his second multi-homer game of the season Sunday at TNS. FEELS GOOD AT THE TOP: The Generals 57 wins are the most in the Southern League. Jackson ranks 1st in pitching, with a 3.16 ERA. The Generals lead the league in total bases, slugging percentage and home runs with 73. MY BAGS ARE PACKED: The Generals are in a stretch of playing 15 out of 20 games away from Pringles Park. Jackson is 30-15 at home and 27-22 on the road. The Generals are the only team in the Southern League with 25 wins at home and on the road. WHO’S HOT? : INF Rich Poythress extended his hitting streak to a Generals season-high 12 games, batting .429 (18×42) with 7 runs scored, 4 doubles and 4 RBI. -> OF Chih-Hsien Chiang (pictured below, Michelle Gachett) is batting .406 (13×32) with 5 runs scored, 2 doubles, 2 home runs and 3 RBI during his current 7-game hit streak. 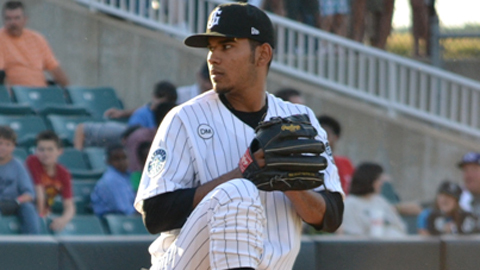 -> RH Yoervis Medina has allowed 1 run in his last 25.2 innings in relief (0.36 ERA). During this 17 game stretch has limited opponents to a .209 (19×91) average, while walking 8 and striking out 27. HELLO AGAIN, SMOKIES: The Generals face off with the Chicago Cubs AA affiliate Smokies 24 times this season. Thus far, Jackson is 11-6 in the I-40 series, 4-1 at Pringles Park and 7-5 at Smokies Park. In 17 meetings, the Generals have smacked 22 homers. VIVA LA ROMERO: INF Stefen Romero has hit safely 17 of 20 games with 12 multi-hit games with Jackson since his promotion, batting .377 (29×77) with 15 runs scored, 8 doubles, 2 triples, 4 home runs and 26 RBI. CAPPING OFF GAMES: RH Carter Capps has allowed only 2 earned runs (3 R) over his last 33.1 (0.54 ERA). This season he is 2-3 with 17 saves (T-1st SL) and a 1.37 ERA (7 ER, 46.0 IP). He has limited opponents to a .208 (36×173) average, while walking 12 and striking out 65. Capps has held opponents scoreless in 31 of 35 relief appearances this season. TODAY’S GAME: With the series tied at 1-1, the Generals play game 3 tonight at Smokies Park, with first pitch at 6:15 CT. Jackson leads the SL North standings by 1 1/2 games over the Chattanooga Lookouts and 3 1/2 games over the Smokies. GENERALS RECAP: Jackson matched a season-high, blasting four home runs Sunday, defeating Tennessee at Smokies Park, 6-1 to even the series at 1-1. Joe Dunigan added his second, two-homer performance of the season (last 4/21) and was 2-for-4. Stefen Romero was 2-for-5 with a double, homer and 3 RBI. Chih-Hsien Chiang was 2-for-5 and added a home run in the 9th, going back-to-back with Romero. Leury Bonilla was 2-for-5 with a run scored. James Paxton (4-3) earned his first win since May 3rd Sunday with 6.0 innings pitched, allowing just 1 run on 8 hits. Paxton walked 1 and struck out 6. Jonathan Arias earned a hold with 2.0 scoreless frames and Carter Capps pitched a scoreless ninth in a non-save situation. DUNIGAN NAMED SL HITTER OF THE WEEK: Today the Southern League announced that Generals OF/DH Joe Dunigan (pictured right, Michelle Gachet) is the SL Hitter of the Week for the second time. He batted .357/.412/1.071 in 4 games this week going 5-for-14, 2 doubles, 1 triple, 2 home runs, 5 RBI, 4 runs, and 1 stolen base during the past week. Dunigan has recorded 11 RBI during his last 8 starts, batting .310 (9×29) with 4 home runs, 4 doubles, 6 runs and 9 RBI. In total this season Joe is batting .275 with 18 home runs (T-1st SL) and 48 RBI. Dunigan ranks 2nd in the league in slugging percentage (.549), 4th in total bases (156) and 4th in extra-base hits (39). He recorded his second multi-homer game of the season Sunday during the Generals 6-1 win over the Tennessee Smokies, at Smokies Park. FEELS GOOD AT THE TOP: The Generals 56 wins are the most in the Southern League. Jackson ranks 1st in pitching, with a 3.11 ERA. The Generals lead the league in total bases, slugging percentage and home runs with 73. MY BAGS ARE PACKED: The Generals are in a stretch of playing 15 out of 20 games away from Pringles Park. Jackson is 30-15 at home and 26-22 on the road. The Generals are the only team in the Southern League with 25 wins at home and on the road. WHO’S HOT? : INF Rich Poythress extended his hitting streak to 11 games, tying a season high, batting .421 (16×38) with 6 runs scored, 4 doubles and 4 RBI. -> OF Chih-Hsien Chiang is batting .407 (11×27) with 5 runs scored, 2 doubles, 2 home runs and 3 RBI during his current 6-game hit streak. -> RH Yoervis Medina has allowed 1 run in his last 23.2 innings in relief (0.33 ERA). During this 16 game stretch has limited opponents to a .205 (17×83) average, while walking 8 and striking out 25. 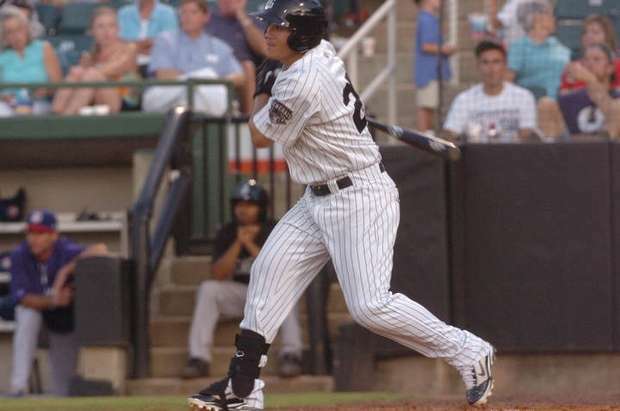 RECORD SETTING NIGHT: Thursday, the Generals broke the Southern League record for doubles in one game with 11, eclipsing the previous mark of 10 set by the Mobile BayBears on May 25, 2000. 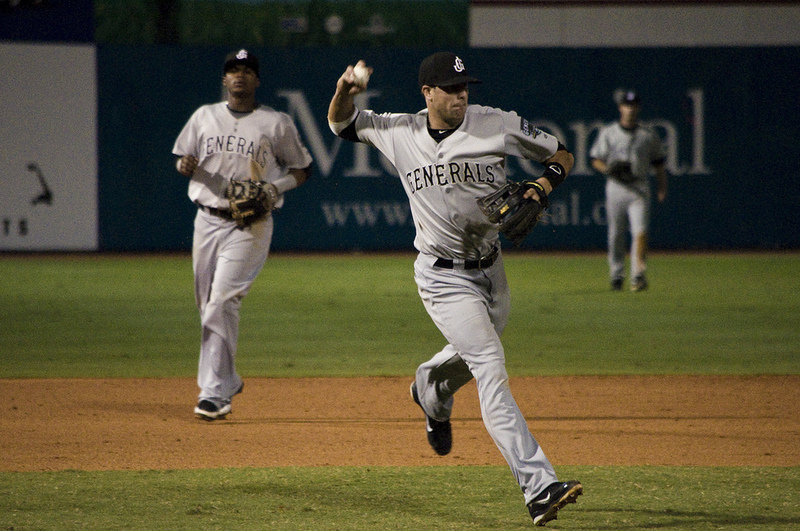 The Generals also matched the league mark with 13 extra-base hits, becoming the first team to do so without the benefit of a homer. VIVA LA ROMERO: INF Stefen Romero has hit safely 16 of 19 games with 11 multihit games with Jackson since his promotion, batting .365 (27×74) with 13 runs scored, 7 doubles, 2 triple, 4 home runs and 24 RBI. CAPPING OFF GAMES: RH Carter Capps has allowed only 2 earned runs (3 R) over his last 32.1 (0.56 ERA). This season he is 2-3 with 16 saves and a 1.40 ERA (7 ER, 45.0 IP). He has limited opponents to a .202 (34×168) average, while walking 12 and striking out 64. Capps has held opponents scoreless in 29 of 33 relief appearances this season. FERNANDEZ MANIA: LH Anthony Fernandez (pictured right, Jesse Garrett) became the first Jackson pitcher in franchise history to post back-to-back 9-inning complete games in his first 2 starts. Fernandez has won each of his first 4 Double-A starts, allowing just 4 ER in 30.0 IP, including a 2-hit, complete game shutout on June 28th at Pensacola. Fernandez is 4-0, with a 1.20 ERA. TODAY’S GAME: The Generals play game 2 of their 4-game series with the Smokies at 4:00 p.m. CT with the Smokies leading the series 1-0. Jackson leads the SL North standings by 1/2 game over the Chattanooga Lookouts and 2 1/2 games over the Smokies. GENERALS RECAP: The Generals had their 4-game win streak snapped with a 4-2 loss to Tennessee on Saturday night. The game was delayed 32 minutes in the 2nd inning due to lightning. Starter Taijuan Walker (6.0,3,4,4,5,6,2HR) made his first start since July 5th and allowed 4 runs on 3 hits in 6.0 innings, suffering the loss. Walker walked a season-high 5 batters and struck out 6. Relievers Jandy Sena (1.1,1,0,0,0,0) and Jose Jimenez (0.2,1,0,0,0,0) combined to hold the Smokies scoreless over the final 2.0 innings. 1B Rich Poythress (1×4, R, 2B) extended his hitting streak to a season-high 10 games with a double in the 2nd inning. 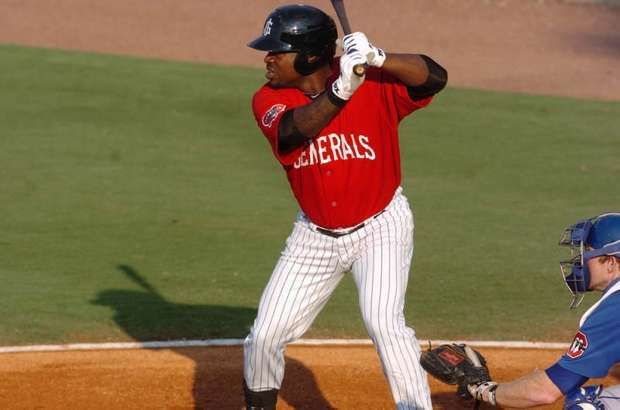 C Ralph Henriquez (2×3, RBI, BB) was only Jackson player with 2 hits, while Henriquez and LF Kalian Sams (1×4, R, HR, RBI) knocked in both of the Generals runs. Sams’ home run was his 8th of the season, coming with 2 outs in the 4th inning. 2B Stefen Romero made his first start since July 9, going 0x4. MY BAGS ARE PACKED: The Generals are in a stretch of playing 15 out of 20 games away from Pringles Park. Jackson is 30-15 at home and 25-22 on the road. The Generals are the only team in the Southern League with 25 wins at home and on the road. WHO’S HOT? : INF Rich Poythress extended his hitting streak to a season-high 9 games, batting .441 (15×34) with 6 runs scored, 4 doubles and 4 RBI. -> OF Joe Dunigan has recorded 9 RBI during his last 7 starts, batting .280 (7×25) with 4 runs scored, 4 doubles, 2 home runs and 9 RBI. -> OF Chih-Hsien Chiang is batting .409 (9×22) with 4 runs scored, 2 doubles, 1 home run and 2 RBI during his current 5-game hit streak. FEELS GOOD AT THE TOP: The Generals 55 wins are the most in the Southern League. Jackson ranks 1st in pitching, with a 3.13 ERA. The Generals lead the league in total bases, slugging percentage, and are tied with Mobile for the league lead with 69 home runs. Jackson ranks 2nd in the league with 97 stolen bases. 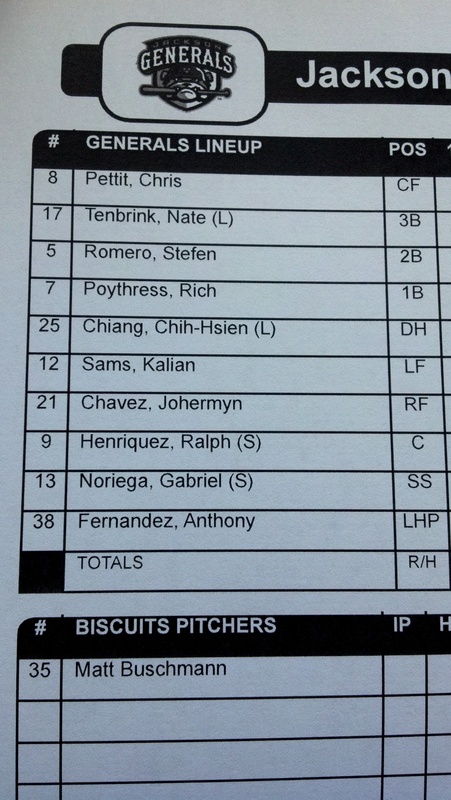 HELLO AGAIN, SMOKIES: The Generals face off with the Chicago Cubs AA affiliate Smokies 24 times this season. Thus far, Jackson is 10-6 in the I-40 series, 4-1 at Pringles Park and 6-5 at Smokies Park. In 16 meetings, the Generals have smacked 18 homers. CAPPING OFF GAMES: RH Carter Capps has allowed only 2 earned runs (3 R) over his last 31.1 (0.58 ERA). This season he is 2-3 with 16 saves and a 1.43 ERA (7 ER, 44.0 IP). He has limited opponents to a .206 (34×165) average, while walking 12 and striking out 64. Capps has held opponents scoreless in 29 of 33 relief appearances this season. TODAY’S GAME: Jackson opens a 4-game series on the road at Tennessee tonight at 5:30 CT. Tonight’s game will mark the end of a 16-game stretch of South Division opponents (10-6). The last meeting with a North Division team was on June 25th vs. Huntsville. RH Taijuan Walker (pictured right, John Shadrick) makes his first start tonight since appearing in last Sunday’s Futures Game in Kansas City. GENERALS RECAP: The Generals and M-Braves were rained out on Friday night at Pringles Park due to heavy rains. The game will be made up as part of a double-header when the Braves return to Pringles Park on Tuesday, August 14th. The Generals won both games in the series and have currently won 4 straight games and 4 series in a row. MY BAGS ARE PACKED: The Generals are in a stretch of playing 15 out of 20 games away from Pringles Park. So far this season, Jackson is 30-15 at home and 25-21 on the road. The Generals are the only team in the Southern League with 25 wins at home and on the road. WHO’S HOT? : INF Rich Poythress has recorded 3 multi-hit games in his last 4 games and extended his hitting streak to 9 games. During this stretch he is batting .467 (14×30) with 5 runs scored, 3 doubles and 4 RBI. RECORD SETTING NIGHT: Last night, the Generals broke the Southern League record for doubles in one game with 11, eclipsing the previous mark of 10 set by the Mobile BayBears on May 25, 2000. The Generals also matched the league mark with 13 extra-base hits, becoming the first team to do so without the benefit of a homer. FEELS GOOD AT THE TOP: The Generals 55 wins is the most in the Southern League. Jackson ranks 1st in pitching, with a 3.12 ERA. The Generals lead the league in total bases, slugging percentage, and are tied with Mobile for the league lead with 68 home runs. Jackson ranks 2nd in the league with 97 stolen bases. HELLO AGAIN, SMOKIES: The Generals face off with the Chicago Cubs AA affiliate Smokies 24 times this season. Thus far, Jackson is 10-5 in the I-40 series, 4-1 at Pringles Park and 6-4 at Smokies Park. In 15 meetings, the Generals have smacked 17 homers. BACK FROM THE FUTURE: Former General Danny Hultzen (1.0,3,1,1,0,1) allowed 1 run on 3 hits and struck out 1 in 1.0 inning, while current General Taijuan Walker (1.0,1,0,0,0,1) tossed a scoreless 7th inning. in the MLB All-Star Futures game last Sunday in Kansas City. Jackson manager Jim Pankovits served as third base coach for U.S. Manager George Brett. Tigers prospect Nick Castellanos went 3×4 with a 3-run homer and 3 runs scored as the U.S. trounced the World team, 17-5, at the SiriusXM All-Star Futures Game at Kauffman Stadium in Kansas City on July 8th. VIVA LA ROMERO: INF Stefen Romero has hit safely 15 of 17 games, but has not played since Monday. Romero has 10 multi-hit games with Jackson since his promotion, batting .369 (25×65) with 12 runs scored, 6 doubles, 2 triple, 3 home runs and 21 RBI. In 3 starts since being promoted for High Desert to Jackson. 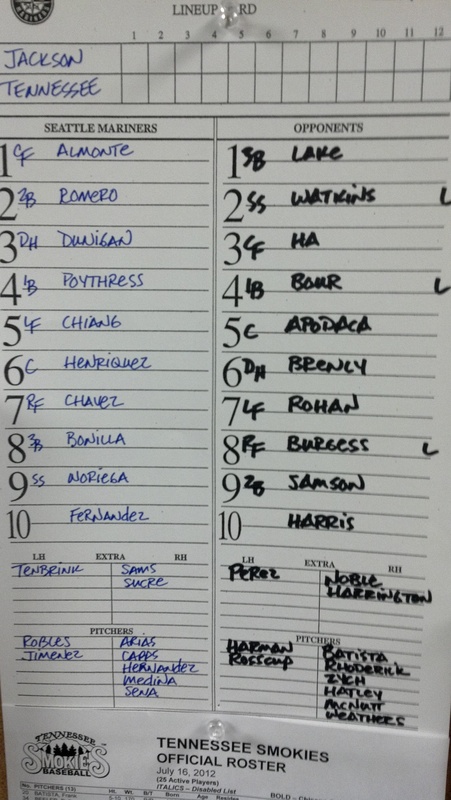 TODAY’S GAME: Tonight the Generals look for the 3-game sweep of the M-Braves and win their 5th game in a row. Jackson is in a stretch of playing 17-straight games (10-6) against the South Division. GENERALS RECAP: The Generals won their 4th straight game Thursday, coming from three behind to beat the M-Braves at Pringles Park, 4-3. Jackson finished off their 4th straight series win and move into first place alone in the second half standings at 13-8 (55-36). 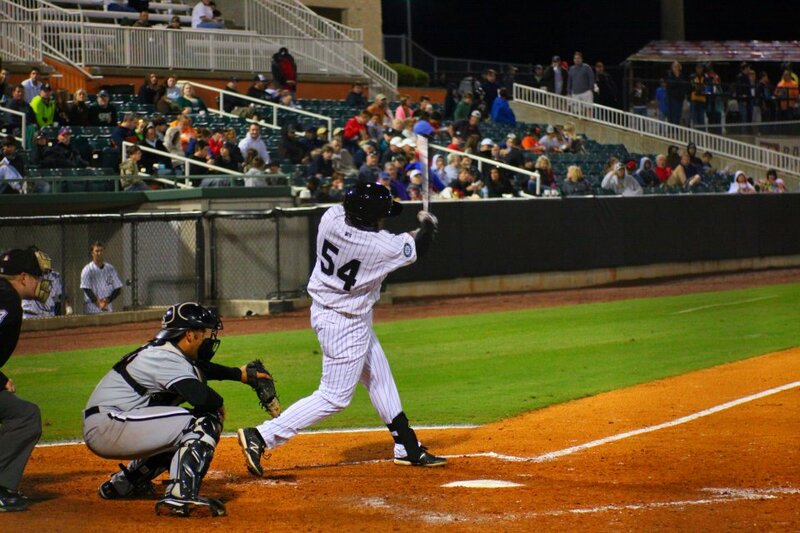 The Generals got on the board in the 4th inning starting with a Joe Dunigan’s 16th double of the season. Dunigan stole third, then came home on a SAC fly by Rich Poythress (1×3, 2 RBI). Jackson added a run in the 6th inning an RBI double by Denny Almonte. Jackson scored again on a RBI groundout from Gabriel Noriega (2×3, double) to tie the game at 3-3. Kalian Sams led off the bottom of the 8th with a pinch-hit triple against Braves reliever Chris Jones (L 2-3, 4.21). Poythress drove in Sams with a single to set the score at 4-3. RHP Forrest Snow (1-3, 4.41) had a quality start for Jackson, allowing 3 earned runs on 6 hits while striking out 3 in 6.1 innings pitched. Reliever Yoervis Medina (2-4, 4.05) earned the win, allowing only one hit in the 8th inning. 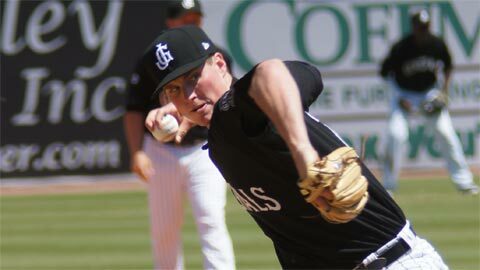 Carter Capps struck out one batter en rout to his 16th save. WHO’S HOT? : INF Rich Poythress (pictured right, AP Photo) has recorded 3 multi-hit games in his last 4 games and extended his hitting streak to 9 games. During this stretch he is batting .467 (14×30) with 5 runs scored, 3 doubles and 4 RBI. TOPS IN THE LEAGUE: The Generals 55-36 record is the best in the Southern League. Also, Jackson ranks 1st in pitching, with a 3.12 ERA. The Generals lead the league with 68 home runs and rank 2nd in the league with 97 stolen bases. GENERALS VS. BRAVES: The Generals and M-Braves meet 16 times this season and 13 times at Pringles Park. This season Jackson leads the series 7-3 and the all-time series 77-76. Jackson has a 2.17 ERA against the Braves this season and has belted 6 home runs. VIVA LA ROMERO: INF Stefen Romero has hit safely 15 of 17 games with 10 multi-hit games with Jackson since his promotion, batting .369 (25×65) with 12 runs scored, 6 doubles, 2 triple, 3 home runs and 21 RBI. In 3 starts since being promoted for High Desert to Jackson. CAPPING OFF GAMES: RH Carter Capps (pictured right, John Shadrick) has allowed only 2 earned runs (3 R) over his last 31.1 (0.58 ERA). This season he is 2-3 with 16 saves and a 1.43 ERA (7 ER, 44.0 IP). He has limited opponents to a .206 (34×165) average, while walking 12 and striking out 64. Capps has held opponents scoreless in 29 of 33 relief appearances this season. CHECKING IN ON MARTINEZ: Generals infielder Francisco Martinez, currently rehabbing with the AZL Mariners has played in 6 games, batting .381 (8×21), with 2 doubles, 2 triples and 6 RBI. 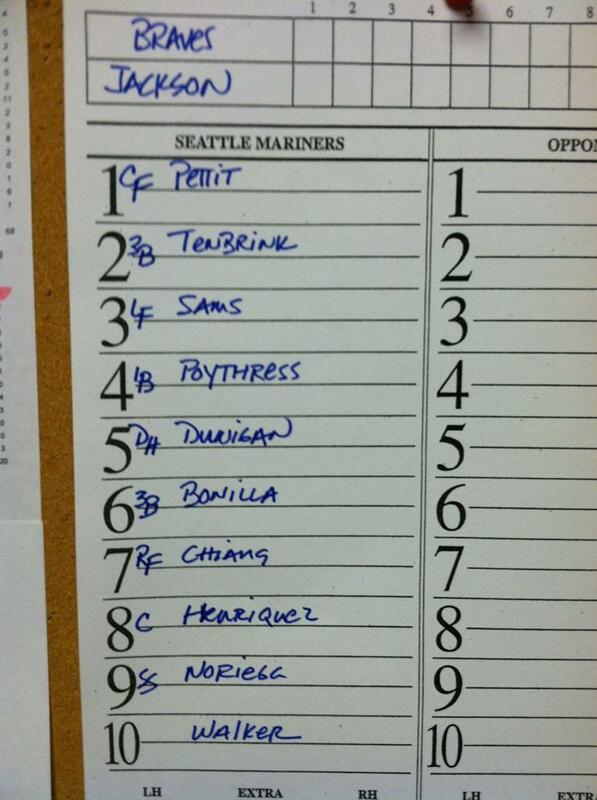 Martinez was placed on the DL June 7th with a pulled hamstring. TODAY’S GAME: Jackson looks to win its 4th straight series tonight and win their 4th straight game in the middle game of the 3-game series against the M-Braves. The Generals are in a stretch of playing 17-straight games (9-6) against the South Division. GENERALS RECAP: In a record setting night at Pringles Park, the Generals blasted the M-Braves in the opener of the 3-game series, 16-6. The Generals set a Southern League record for most doubles in a game with 11 and tied a league record with 13 extra-base hits. Jackson also set season-highs in runs and hits, with 18 knocks. 8 Generals collected extra-base hits (Nate Tenbrink (pictured below, Tug McGraw) (3×5, 3 2B), Rich Poythress (2×4, .294), Denny Almonte (3×6, 4 RBI), Joe Dunigan (2×4, 3 RBI), Leury Bonilla (2×4, 2B, RBI), Chih-Hsien Chiang (2×4, 2B, RBI), Gabriel Noriega (2×5, RBI), Jesus Sucre (2×5, 2B, RBI)). RH Brandon Maurer (6-2, 3.87 ERA) pitched 5.0 solid innings before a rocky 6th inning. Maurer allowed 5 earned runs on 4 hits, walked 2 and struck out 6 in the win. 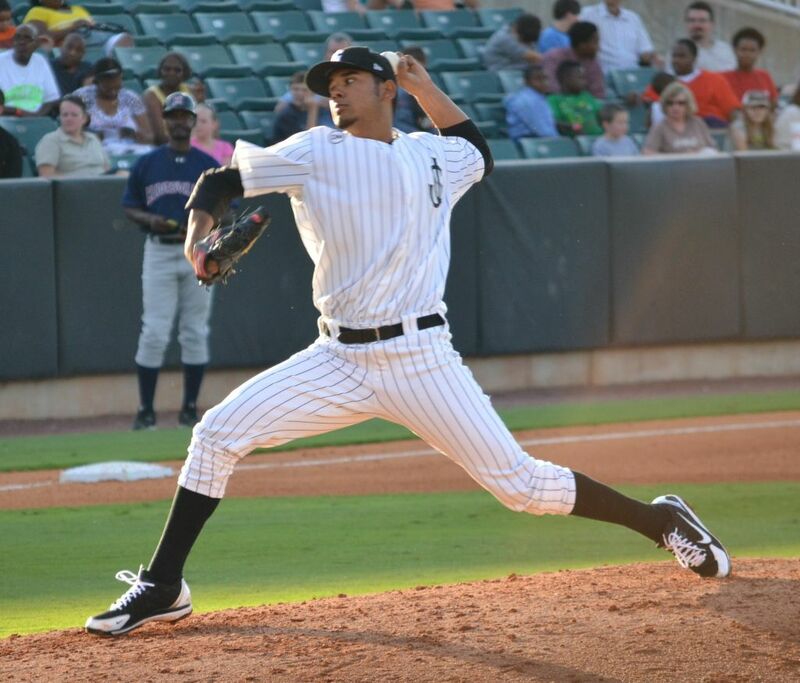 LH Jose Jimenez earned the hold, striking out 2 in 1.1 innings of work. TOPS IN THE LEAGUE: The Generals 54-36 record is the best in the Southern League. Also, Jackson ranks 1st in pitching, with a 3.12 ERA. The Generals lead the league with 68 home runs and rank 2nd in the league with 96 stolen bases. GENERALS V BRAVES: The Generals and M-Braves meet 16 times this season and 13 times at Pringles Park. This season Jackson leads the series 6-3, while the the all-time series is tied 76-76. Jackson has a 2.09 ERA against the Braves this season and has belted 6 home runs. BACK FROM THE FUTURE: Former General Danny Hultzen (1.0,3,1,1,0,1) allowed 1 run on 3 hits and struck out 1 in 1.0 inning, while current General Taijuan Walker (1.0,1,0,0,0,1) tossed a scoreless 7th inning. in the MLB All-Star Futures game yesterday in Kansas City. Jackson manager Jim Pankovits served as third base coach for U.S. Manager George Brett. Tigers prospect Nick Castellanos went 3×4 with a 3-run homer and 3 runs scored as the U.S. trounced the World team, 17-5, at the SiriusXM All-Star Futures Game at Kauffman Stadium in Kansas City on Sunday afternoon. CAPPING OFF GAMES: RH Carter Capps has allowed only 2 earned runs (3 R) over his last 30.1 (0.59 ERA). This season he is 2-3 with 15 saves and a 1.47 ERA (7 ER, 43.0 IP). He has limited opponents to a .210 (34×162) average, while walking 12 and striking out 63. Capps has held opponents scoreless in 28 of 32 relief appearances this season. CHECKING IN ON MARTINEZ: Generals infielder Francisco Martinez (pictured right, Seth Chandler), currently rehabbing with the AZL Mariners has played in 4 games, batting .385 (5×13), with 2 triples and 5 RBI. 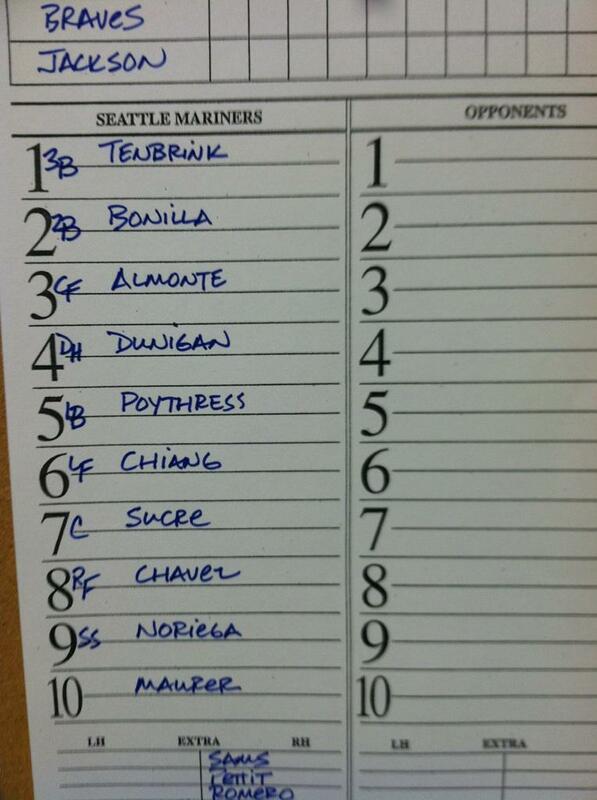 Martinez was placed on the DL June 7th with a pulled hamstring. 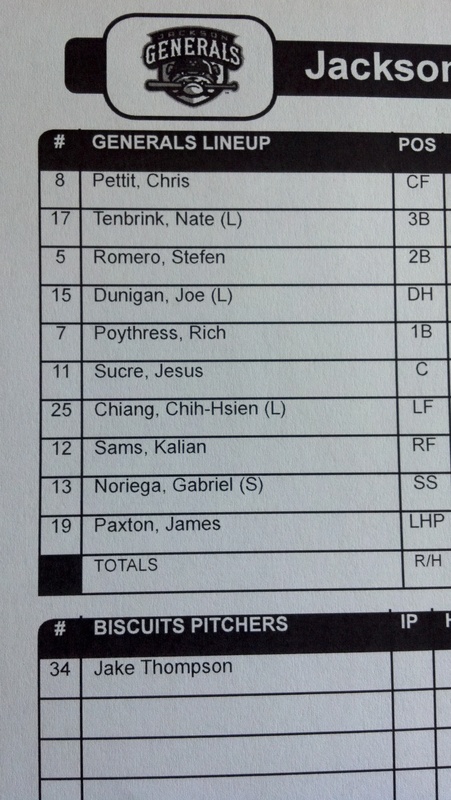 TODAY’S GAME: Jackson begins a short 3-game homestand tonight against the Mississippi Braves. The Generals took 2 of 3 from the M-Braves at Trustmark Park 7/4-7/6. The Generals are in a stretch of playing 17-straight games (8-6) against the South Division. GENERALS RECAP: The Generals won their 2nd straight and take the series in Montgomery, winning on 3-1 on Monday. The Generals concluded their 6-game, 2-city road trip 4-2 and winners of their last 3 series. Montgomery stranded 14 runners on-base, including the bases loaded in 3 innings. Jackson comes home in a first place tie with Chattanooga in the second half standings. Starter Anthony Fernandez (5.0,7,1,1,6,4) won his 4th straight start to open his Double-A career Monday, despite not having his best command. Fernandez allowed just 1 run on 7 hits over 5.0 innings, walking 6 and striking out 4. Relievers Jandy Sena (2.0,0,0,0,0,1) and Carter Capps (2.0,2,0,0,1,2) combined to toss 4.0 scoreless innings to secure the win. Capps recorded his 15th save of the season, marking the 9th time this season to toss more than an inning to record a save. 1B Rich Poythress (3×4, R) led the team with 3 hits, while DH Chih-Hsien Chiang (1×4, R, HR, RBI) and C Ralph Henriquez (1×4, R, HR, RBI) each recorded 1 RBI on solo home runs. GENERALS V BRAVES: The Generals and M-Braves meet 16 times this season and 13 times at Pringles Park. This season Jackson leads the series 5-3, while the Braves lead the all-time series 76-75. Jackson has a 1.88 ERA against the Braves this season and has belted 6 home runs. CHECKING IN ON MARTINEZ: Generals infielder Francisco Martinez, currently rehabbing with the AZL Mariners has played in 4 games, batting .385 (5×13), with 2 triples and 5 RBI. Martinez was placed on the DL June 7th with a pulled hamstring. FERNANDEZ MANIA: LH Anthony Fernandez became the first Jackson pitcher in franchise history to post back-to-back 9-inning complete games in his first 2 starts. Fernandez has won each of his first 4 Double-A starts, allowing just 4 ER in 30.0 IP, including a 2-hit, complete game shutout on June 28th at Pensacola. Fernandez is 4-0, with a 1.20 ERA. TOPS IN THE LEAGUE: The Generals 53-36 record is the best in the Southern League. Also, Jackson ranks 1st in pitching, with a 3.11 ERA. The Generals lead the league with 68 home runs and rank 2nd in the league with 96 stolen bases. WHO’S HOT? : RH Yoervis Medina has allowed 1 run in his last 22.2 innings in relief (0.38 ERA). During this 15 game stretch has limited opponents to a .203 (16×79) average, while walking 8 and striking out 25. 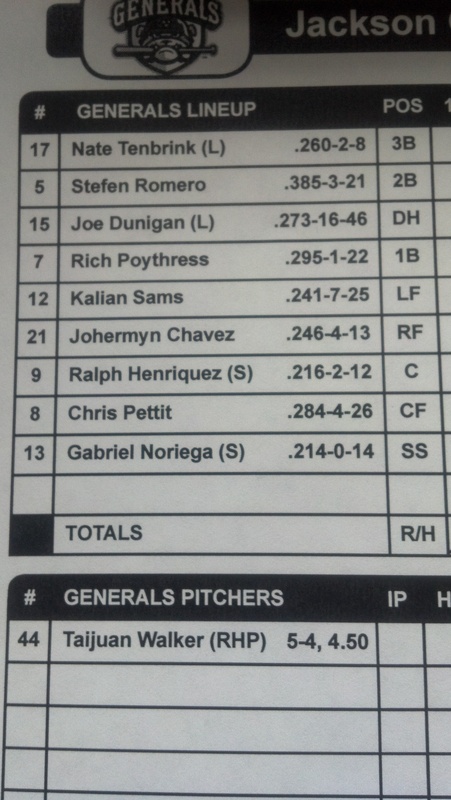 TODAY’S GAME: The Generals play the rubber match of the 3-game set at Montgomery tonight. Jackson is currently on a 6-game, 2-city road trip in Mississippi (2-1) and Montgomery (1-1). The season series with the Biscuits is tied 5-5. Jackson leads the overall series, 67-64. FERNANDEZ MANIA: Today’s starter LH Anthony Fernandez (pictured right, Jesse Garrett) became the first Jackson pitcher in franchise history to post back-to-back 9-inning complete games in his first 2 starts. Fernandez has allowed just 3 ER in 25.0 IP in his first 3 starts in Double-A, including a 2-hit, complete game shutout on June 28th at Pensacola. Fernandez is 3-0, with a 1.08 ERA. GENERALS RECAP: Jackson recorded 14 hits and evened the series with an 8-3 over Montgomery on Sunday night. 2B Stefen Romero extended (3×5, R, 2 RBI) extended his hitting streak to 9 games and has added an RBI in each of his last 5 games. CF Chris Pettit (4×6, R, 2B, RBI) led the team with 4 hits, while Romero, 1B Rich Poythress (2×3, BB) and LF Chih-Hsien Chiang (2×5, R) each recorded a mult-hit game. LH James Paxton (4.1,6,1,1,1,8) started the game for Jackson but did not factor in the decision. Paxton struck out 8 and allowed only 1 run on 6 hits in 4.1 innings in only his 2nd start since returning from the DL. RH Jonathan Arias (1.0,2,0,0,1,0) picked up his first win with Jackson this season, allowing 2 hits and walking 1 in a scoreless inning. RH Yoervis Medina (2.0,0,0,0,0,2) earned a hold by tossing a scoreless 7th and 8th while striking out 2, while LH Jose Jimenez (1.0,0,0,0,1,1) walked 1 and struck out 1 in a scoreless 9th inning. VIVA LA ROMERO: INF Stefen Romero extended his hitting streak to 9 games, batting .378 (14×37) with 8 runs scored, 3 doubles, 1 triple, 1 home run and 13 RBI. He has also hit safely 15 of 16 games with 10 multi-hit games with Jackson since his promotion. During this stretch is batting .381 (24×63) with 12 runs scored, 6 doubles, 2 triple, 3 home runs and 21 RBI. In 3 starts since being promoted for High Desert to Jackson. CAPPING OFF GAMES: RH Carter Capps allowed on 2 runs on 3 hits in 0.1 innings, snapping his streak of 28.0 consecutive innings without allowing an earned run. It marked a stretch of 21 relief appearances since May 3 to not allow an earned run. This season he is 2-3 with 14 saves and a 1.54 ERA (7 ER, 41.0 IP). He has limited opponents to a .208 (32×154) average, while walking 11 and striking out 61. Capps has held opponents scoreless in 27 of 31 relief appearances this season. MARTINEZ BEGINS ROAD BACK: Generals infielder Francisco Martinez Thursday was placed on a rehab assigment with the AZL Mariners. Martinez was placed on the DL on June 7th with a pulled hamstring. Martinez is the team leader with 21 stolen bases this season. 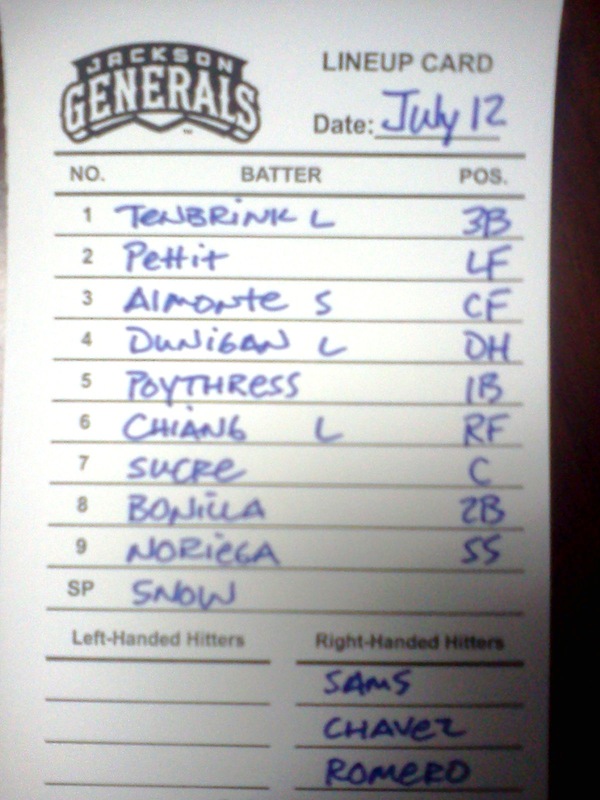 TODAY’S GAME: The Generals look to try and even the series with Montgomery today in game 2 of the set. Jackson is currently on a 6-game, 2-city road trip in Mississippi (2-1) and Montgomery (0-1). The season series with MTG is tied 4-4. Jackson leads the overall series, 66-64. GENERALS RECAP: The Generals dropped their 2nd straight Saturday in the opener in Montgomery, 7-2 to the Biscuits. Jackson is now 2-2 on the current two-city, six-game road trip. Montgomery started their scoring in the 1st inning with a Hak-Ju Lee triple and he scored on a SAC fly from Ty Morrison. Jackson tied the game at 1-1 in the top of the 2nd on a double by DH Joe Dunigan that scored 1B Rich Poythress. The RBI was Dunigan’s 41st on his team-leading 16th double. Brett Nommensen brought in 2 runs with a double for Montgomery in the 2nd inning placing the Biscuits on top 3-1. 2B Stefen Romero upped his hitting streak to eight games in the 3rd with a 2-out RBI single to left that scored SS Gabriel Noriega, trimming the lead to 3-2. From then on out it was all Biscuits. The Rays Double-A club scored single runs in the 3rd 5th, 7th and 8th to go on for the 7-2 win. Jackson starter Forrest Snow (1-3) tossed 4.2 innings, allowing 5 runs (4 earned) on 3 hits. Snow walked 5 and struck out 3. The Generals pounded out 9 hits and were led by Noriega, who finished 2-for-4 with a pair of doubles and run. THE FUTURE IS NOW: Generals Manager Jim Pankovits was selected as a coach for the U.S. All-Star team and will coach along side manager George Brett. RHP Taijuan Walker was selected to play for the U.S. squad in the 14th annual SiriusXM All-Star Futures Game to be played today at Kauffman Stadium in Kansas City (4 p.m. CT/ESPN2, MLB Network Radio) as part of All-Star weekend. VIVA LA ROMERO: INF Stefen Romero has hit safely 14 of 15 games with 8 multi-hit games with Jackson since his promotion. During this stretch is batting .379 (22×58) with 11 runs scored, 6 doubles, 2 triple, 3 home runs and 19 RBI. Romero has RBI’s in his last 4 games and is currently on an 8-game hit streak. K-PAX IS BACK: After missing more than a month with a knee injury LHP James Paxton returned from the DL Tuesday after missing more than a month with a knee injury, tossing 4.0 scoreless innings. Paxton ranks as the 4th best prospect in the Mariners organization, according to Baseball America. 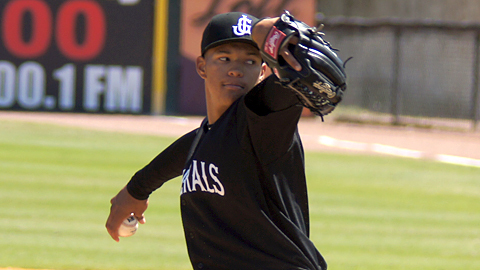 He ranks as the 8th best left-handed pitching prospect and 77th overall prospect in baseball, according to MLB.com. FERNANDEZ MANIA: Thursday’s starter LH Anthony Fernandez became the first Jackson pitcher in franchise history to post back-to-back 9-inning complete games in his first 2 starts. Fernandez has allowed just 3 ER in 25.0 IP in his first 3 starts in Double-A, including a 2-hit, complete game shutout on June 28th at Pensacola. Fernandez is 3-0, with a 1.08 ERA. TOPS IN THE LEAGUE: The Generals 51-36 record is the best in the Southern League. Also, Jackson ranks 1st in pitching, with a 3.14 ERA. The Generals lead the league with 65 home runs and rank 2nd in the league with 92 stolen bases. WHO’S HOT? : LH Mauricio Robles has allowed only 1 run in his alst 18.0 innings in relief. During this 13 game stretch in relief he has limited opponents to a .080 (4×50) average, while walking 8 and striking out 18. Overall in 18 games with Jackson, Robles is 1-0 with a 2.42 ERA (7 ER, 26.0 IP).